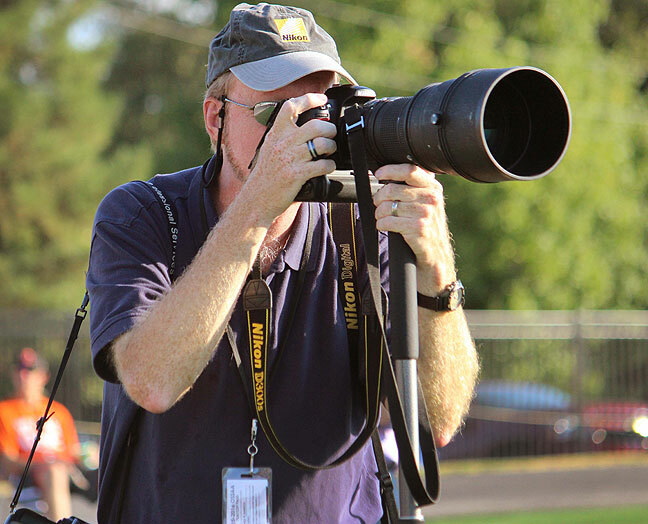 Your host shoots a college football game with the Nikon D300S and the AF Nikkor 300mm f/2.8 ED-IF. My newspaper bought a Nikon D300S digital SLR for me in June. I posted a first look at the camera and made some initial observations. Here, then, are my impressions of the camera after its first 7500 frames. 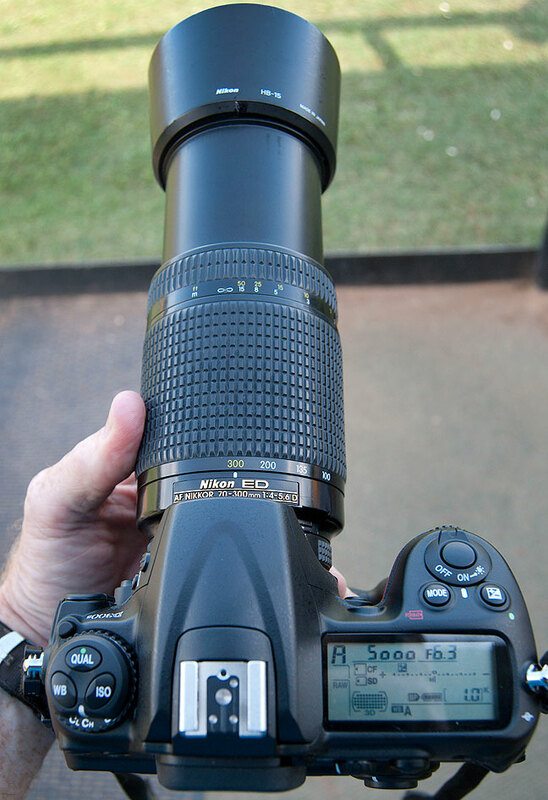 Clean images at ISOs in the 800-1600 range have breathed new life into my AF Nikkor 70-300mm f/4-5.6. The autofocus is fast, but isn’t as well buffered as I like, and has a tendency to bite on the background instead of the subject. Tweaking and patience has made it work. Despite the promise of 8 frames per second with the bigger EN-EL4 battery, I suspect it barely runs at 7 fps. The buffer with RAW files is just 12 frames, and while it flushes files quickly to the class 10 SD card, the buffer is still not quite big enough for sports, particularly baseball. Image quality in the ISO stratosphere is pretty good; I’ve shot football at ISO 4000 and the result has been decently clean. Cleaner medium ISOs in the 800-1600 range have breathed new life into an old lens, my 70-300mm f/4-5.6 ED. Since this lens needs to be stopped down to f/6.3 to be sharp at 300mm, higher ISOs save the day for softball and baseball action. My 300mm f/4 ED AF is a great lens, but the 70-300mm is three times lighter, and more versatile. The D300S is lighter than my older D2H, but not any smaller. Larger cameras are fine for my hands, but the lighter body is definitely appreciated. 7500 frames in two months equals 45,000 frames in a year, but that’s only my primary camera, and June and July are our slowest months. If you add to that what I shoot with other cameras (I always shoot with two, sometimes three), the total might be about 100,000 frames a year, which doesn’t surprise me. In conclusion, the Nikon D300S is an excellent addition to my photographic toolbox. 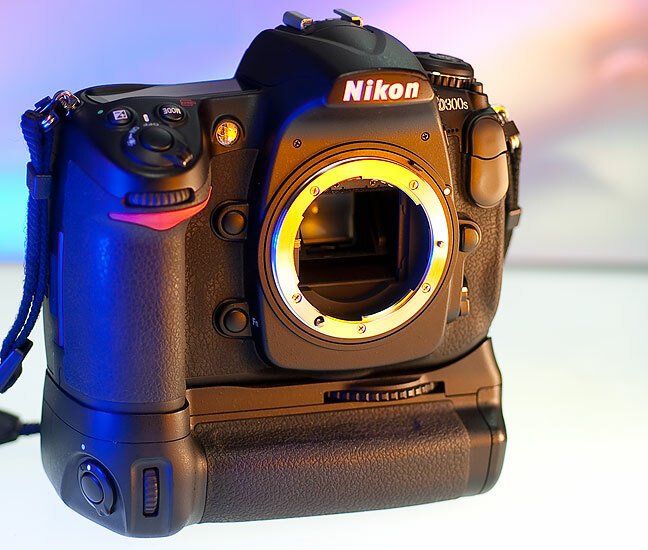 The Nikon D300S is pictured here with the MB-D10 vertical grip, with the EN-EL4 battery installed. Would love to get my hands on one of those. I had this issue with my Rebels, especially the XT (350D), but it was worse with some lenses than others. This happened even when I selected center-AF-point only, and when the AF point was exactly on the subject. So the camera was seeing *around* the subject, beyond the AF point, to focus on something I had clearly not indicated. Frustrating. Fortunately, my current camera never has this issue. The time approaches when I will need a tool of similar ilk. Till then I fly with the birds I have.